I’m 26, and I finished my degree 5 years ago. Yet, I’m still walking around with my in-date student discount card and reaping the rewards of it. In this post, I’ll teach you exactly how you can get an NUS card without being a student. What Is A NUS Card? Is A NUS Card Worth It? NUS has recently been renamed to Totum. The card has changed from a light blue to a bright pink. However, the back has remained blue, and the front of the card still features the NUS logo. I’ve not had any contact from NUS as to why they have done this. Personally, I found it to be a pretty pointless change. However, I just wanted to make those aware who might notice this and be unsure when purchasing a student card in the near future. 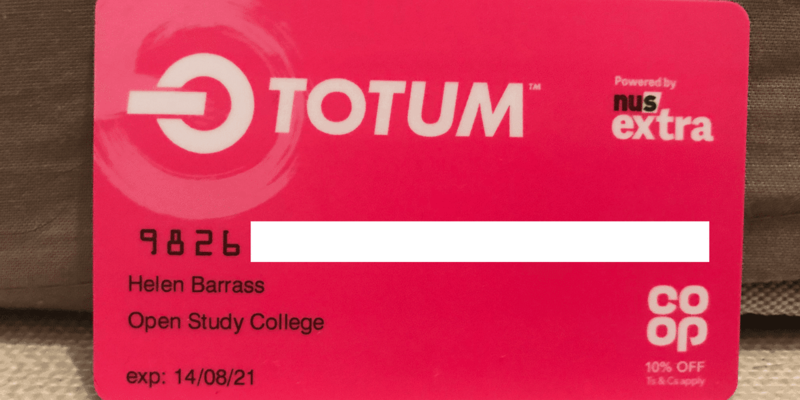 An NUS card, or Totum as they are now called is a student discount card. These are available for students to purchase online. Upon showing the card at a registered retailer, the student is expected to get a special offer or discount. Right now, the NUS card costs £12 for the year (although there’s a slight discount if you buy 3 years in advance). I love my NUS card. I love it even more now that I can get it without being a student. Which is why I’ve put together this complete directory of where you can get a student discount. This is an open document, meaning you’re able to contribute. So if you know of anywhere in the world that offers a student discount for students then feel free to add it to the sheet using this form. Fashion Bench 20% - 25% UK 20% standard student card. 25% off with NUS Extra card. Other Foyles 10% UK email [email protected] with your name, place of study and course details. We will email you a code which should then be entered each time you check out on the Foyles website to receive your discount. There are also discounts that I get that aren’t listed on the NUS website. Such as 13% off at Showcase cinemas. I’ve also been given a student discount thanks to my student discount card in Brighton while visiting The Royal Pavilion – saving me £1.80 on my entry fee. So let’s do some simple math and see if a student discount card is right for you. Let’s assume you spend £100 in the Co-Op over the course of a year. You visit the cinema once every other month and spend £30 in Superdrug. Through these simple expenses, you would actually save £28. Therefore after the cost of a student discount card you’ve actually saved yourself £16. That £16 saving is based on some pretty savvy spending. It’s worth having a look through your bank statements over the past three months and seeing how much you could have saved with a student discount card. Your new student discount card will now be sent to your address in the post and should arrive within 7 days. I’d advise buying a three-year card rather than a one year or two years. Not only is it cheaper, it also protects you from any changes NUS make to the card in the coming years. Once you’ve received your NUS card in the mail you are ready to start reaping the rewards of being a cardholder/student but where do you start? Well, using your NUS card in a store couldn’t be easier. As the cashier is scanning through your products mention that you have a student discount card or NUS card, the cashier will then instruct you as to the information required. In 90% of cases, they just want to see the card in order to ensure it’s valid. In some cases they may be required to scan it – I know that’s the case with the Co-Op. It’s always worth keeping your eyes peeled for special student discounts especially around September when the University students get their first student loan as discounts are often increased or special offers are announced for students only. It’s also worth asking about student discounts in local restaurants etc. you’ll be surprised at the number of places offering the discount. Your student discount card has your photograph on therefore it can not be used by anyone else. It’s therefore, important to let your friends and family know about this completely legal and legitimate student discount card hack so they can benefit too. My girlfriend Helen got a student discount card as well as me so we are both able to benefit from the reduced rate at the cinema and gain 2 for 1 thanks to Meerkat movies. This brings our trips to the cinema down to £10 for the two of us.